Do you remember the BMW with the weird doors? This is it. 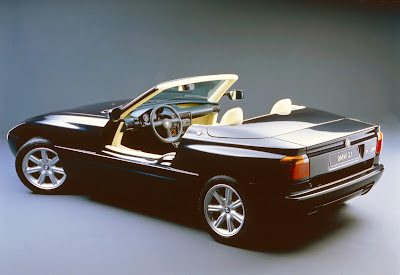 The BMW Z1, with retractable doors. They don't open, they drop down. This car was approved for Show or Display, although now the 1988 cars are actually over 25 years old, and NHTSA exempt. 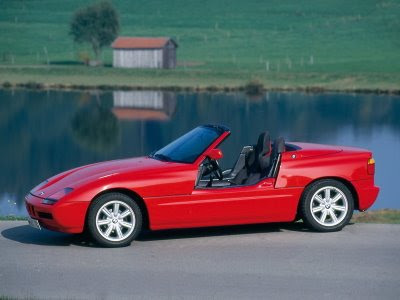 BMW sold 8,000 BMW Z1's, much outside the normal 500 cars for Show or Display, someone at the NHTSA must have liked the little Miataesk roadster with the odd doors. The doors retract vertically down into the car's body instead of swinging outward or upward. The inspiration for these doors came from more traditional roadsters which often feature removable metal or cloth doors. Because removable doors did not fit within BMW's design goals, the retractable doors were installed instead.